"Generally played with a slide, his precisely and thoughtfully articulated guitar doesn't slip, but may pick unusual routes and paint surprising landscapes. Blues is always there as the basis, but on top of that Roots manages to build almost anything. /---/ Drums on almost all tracks are played by Raul Terep. The duo's cooperation is seamless, with Terep's drums part of the compositions. They're not just keeping time but play and comment along with the guitar. /---/ At their gigs, the duo offer a full-scale show that excites even those who generally find both the blues and instrumental music boring. Every time the unaffected Roots kicks the air or adjust his glasses, it grabs the attention and fits right into the tune at hand, as if the spontaneous movements had been choreographed beforehand." 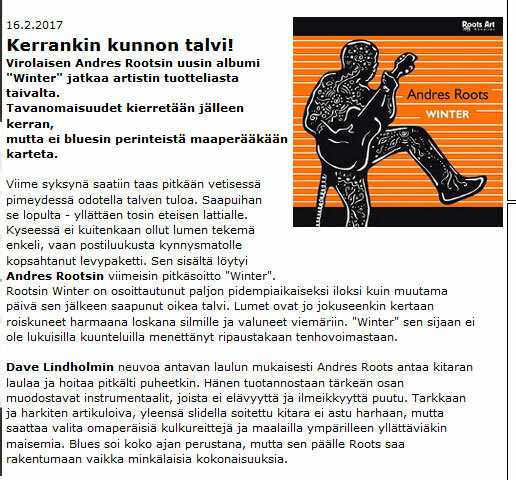 And in Blues News, TT Tarkiainen concludes: "Throughout his recorded output, Andres Roots has managed to stay his course and maintain his trademark: a positive, joyous approach to making music."